Here's what I got in my mailbox this week! Clicking on the titles will take you to the book's Goodreads page. Signed and personalized. Won from Lisa's blog. I was so excited for this because I have a signed copy of Personal Demons. I haven't read the series yet, because I'm waiting for Last Rite to be released. Speaking of, that little note in the bottom left is from Lisa, telling me not to even open the book because the very first sentence is a spoiler. 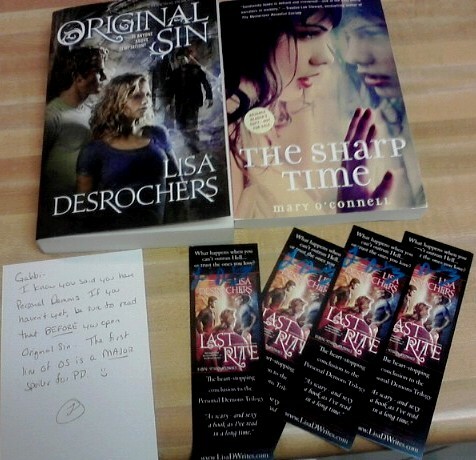 And then some signed bookmarks I can giveaway. An ARC from Random Buzzers. Received from Ashley at What's Your Story? for a blog tour. I still need to read Personal Demons too. Hope you enjoy all your books! The Sharp Time looks really good. I hope you enjoy everything you got this week. Here's my IMM! Oh you"re lucky! I'm curious to read the lisa desrichers series. Enjoy all your new books! Awesome job with the signed book! Looks like you got some great new reads lucky you!